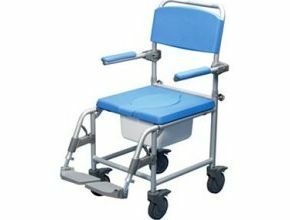 These Deluxe Shower Commode Chairs feature a lightweight, silver painted aluminium frame, which provides a rust free, high strength product. It is available as an attendant-propelled version or a self-propelling version that offers the user independence. The front castors have brakes for security; the swing away detachable footrests offer comfort while being transported and the armrests can be flipped back to facilitate side transfer. The chair can be used in a shower cubicle or wet room, used as a commode or used over a standard toilet bowl. The front of the seat is cut away to facilitate personal hygiene, however a seat insert is provided for comfort during transport. A square bowl is fitted as standard. The detachable back means the shower commode chair is more compact for storage. Very pleased with this chair, its nice on the eye and well built, Nice padded seat too. Good design ! !